The monsters of Greek mythology are some of the most famous characters to appear in the tales of Ancient Greece, and today the likes of Cerberus remain famous. These monsters offered worthy opponents for gods and heroes to overcome. Just as the Greek gods and heroes had their own genealogies, so the monsters of Greek mythology also had an origin story connected with them, for there was a “mother of monsters”, the female monster Echidna. Where did Echidna come from? 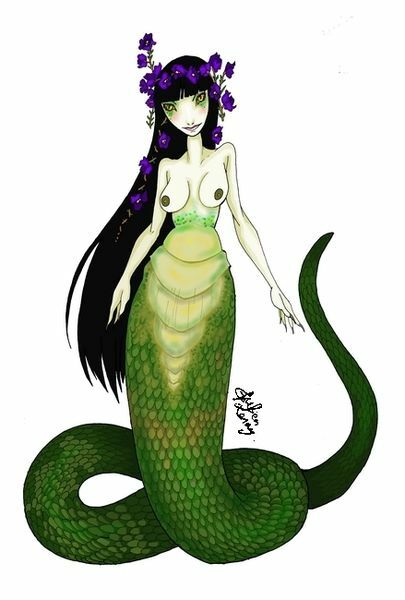 Echidna is generally considered to be the daughter of the primordial sea god Phorcys and his partner Ceto; Ceto being considered to be the personification of the dangers of the deep. This is the genealogy given by Hesiod in the Theogony, although in the Bibliotheca (Pseudo-Apollodorus), the parents of Echidna were given as Gaia (Earth) and Tartarus (Underworld). Phorcys and Ceto though, were commonly named as parents of other monsters including Ladon, Scylla, the Aethiopian Cetus, and the Trojan Cetus. No images of Echidna from antiquity survive, but descriptions from this period normally describe Echidna as being half beautiful nymph and half serpent in appearance. This meant that her upper body, from the waist, was feminine, whilst the bottom half comprised of either a single or double serpent tail. In addition to her monstrous appearance, Echidna also had other monstrous characteristics, and Echidna was said to have developed a taste for raw human flesh. Echidna though was not unique in being half humanoid and half serpent, and she found a similar monster to become her partner. This monster was Typhon, also known as Typhoeus, who was himself the offspring of Gaia and Tartarus. Typhon was a more monstrous version of Echidna, for as well as being half serpent, Typhon was gigantic, and his head was said to brush the sky dome overhead. Typhon’s eyes were made of fire, and upon each of his hands sprouted the heads of a hundred dragons. Echidna and Typhon found themselves a home on earth, and the pair would live in a cave somewhere in a region named Arima. It was in this cave of Arima that Echidna would set about living up to the moniker of “mother of monsters”, for she and Typhon would bring forth a string of monstrous offspring. Lernean Hydra – the multiple headed water serpent who roamed the swamps of Lerna and guarded one of the entrances to the Underworld. Via Orthus and the Chimera, Echidna was also grandmother to the Sphinx and the Nemean Lion. The role of monsters in Greek mythology was basically as opponents for heroes and gods to overcome, and as a result the children of Echidna would encounter deadly foes. Echidna would blame Zeus for the deaths of her children, especially as it was Zeus’ son Heracles who had done much of the slaying. As a result, Echidna and Typhon would go to war with the gods of Mount Olympus. 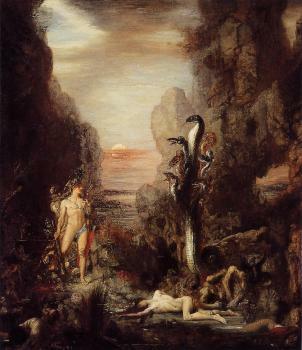 Leaving Arima, Typhon and Echidna rampaged their way towards Mount Olympus. Even Greek gods and goddesses trembled at the rage of Typhon and his wife, and most fled from their palaces, indeed Aphrodite was said to have transformed herself into a fish to escape. Many of the gods would seek sanctuary in Egypt, and their continued to be worshipped in their Egyptian forms. The only god to stay behind was Zeus, and occasionally it was said that Nike and Athena stayed by his side. Zeus would of course have to meet the threat to his rule, and Typhon and Zeus undertook an epic fight. At one point Typhon was even in the ascendancy, and Zeus required Athena to tie back tendons and muscles so that he could continue the fight. Eventually of course, Zeus would overcome Typhon and the partner of Echidna would be hit by a thunderbolt thrown by Zeus. Afterwards, Zeus buried Typhon beneath the Mount Etna where his struggles for freedom continue to be heard today. Zeus dealt mercifully with Echidna though, and accounting for her lost children, the “mother of monsters” was allowed to remain free, and indeed Echidna was said to have returned to Arima. According to Hesiod, Echidna was immortal so the “mother of monsters” was thought to continue to live in her cave, occasionally devouring the unwary who passed by its entrance. Other sources though tell of the death of Echidna, for Hera would dispatch the hundred eyed giant, Argus Panoptes, to kill the monster because she was feeding on the unwary. Argus Panoptes would therefore kill Echidna whilst the monster slept.